Brighton Bar and Grill is an American Bistro located in the heart of beautiful downtown Brighton, Michigan. Our mission is to provide a family dining experience that features high quality food, professional friendly service and a warm, comfortable, family orientated dining environment, delivering value that you will love and will persuade you to put us on your short list of restaurants to revisit. 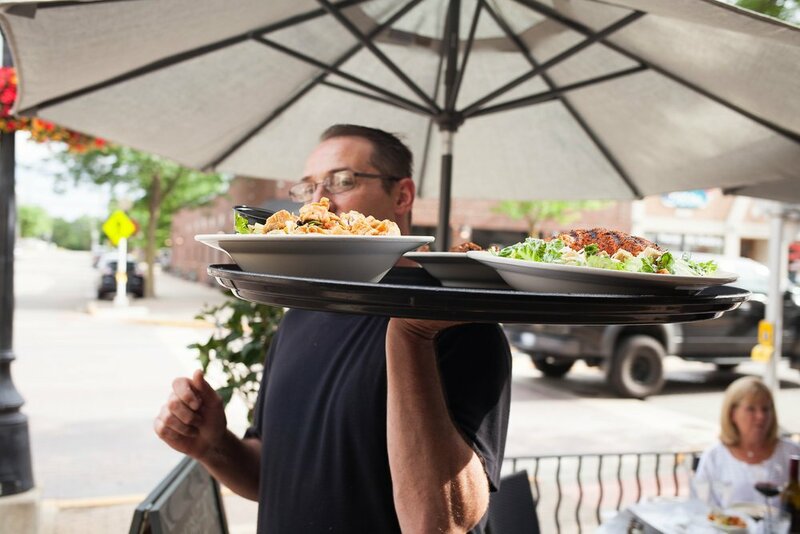 We are very dedicated, motivated and energetic owners who have spent many years learning our craft, excited with the opportunity to serve you at Brighton Bar and Grill. So prepare yourself for a fabulous dining experience. candied pecans, bleu cheese, red onion, dried michigan cherries, poached bosc pears, dark cherry vinaigrette. gluten free. pickled beets, goat cheese, tossed with mixed greens and baby arugula blend, sliced apples, shaved red onion, apple vinaigrette. gluten free. chopped turkey, ham & swiss, diced gherkin pickles, cherry tomatoes, hard boiled egg, house greens, tossed in maurice dressing. gluten free. candied pecans, bleu cheese, red onion, dried michigan cherries, poached bosc pears, tossed in dark cherry vinaigrette. gluten free. bourbon marinated salmon with a honey ginger glaze, sticky rice, stir-fry veggies. gluten free. 6 ounce filet, gorgonzola butter, yukon gold mashed potato, fresh asparagus. gluten free. Vodka, Cointreau, St. Germain Elderflower Liqueur, Lime Juice, Simple Syrup. Pomegranate Juice, Absolut Citron, Cointreau, Squeeze of Lemon. Rumchata, Banana Liqueur, Franjelico, Walnuts (Garnish). Patron Reposado, Hpnotiq Liqueur, Sweet and Sour, Lime juice.
" Food was delicious, service was excellent, and atmosphere was elegant. Not what you would expect from a bar and grille." " Food was delicious. Service was excellent. Beautiful restaurant inside." Want to ensure that your dinner plans aren't interrupted by wait lines? Reserve a table using OpenTable below and we'll be sure to get your table ready for when you arrive. If you are looking for some high quality carryout food call us at take a look at our menu and then give us a call (810) 229-4115 to place your order over the phone. Our chefs will create your foods and get it packaged for you to pick up. Brighton, MI 48116 and ask the hostess located just inside the door to pickup your order. Have any questions regarding our food, drinks, or space? Drop us a message below and we'll be sure to get back to you with some answers.